If you're feenin' for some action on an unlocked iPhone 5, Apple has announced the prices for them: It'll be $649 for 16GB, $749 for 32GB and $849 for 64GB. That's the same unlocked price as the unlocked iPhone 4S when it released last year. It's certainly a hefty chunk of change and won't become available to US customers for at least "several weeks", according to The Verge, but you're free from the contract of those evil carriers. Of course, you'll still need a carrier plan to use the phone but with an unlocked model you can just plug in a NanoSim and pick whichever carrier you feel like (if it's compatible with your unlocked iPhone 5, that is). 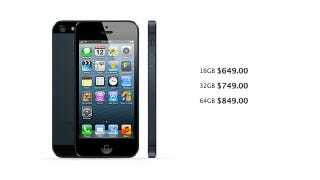 The unlocked iPhone 5 only works with GSM networks so you won't be getting any Verizon or Sprint action here but T-Mobile customers could certainly give it a whirl.